This week in the war, on 27 May 1943, French Resistance leader Jean Moulin called a meeting on rue du Four in Paris. Representatives of eight different resistance groups were in attendance. 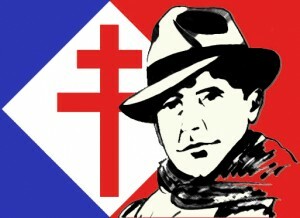 Jean Moulin was the personal envoy of Charles de Gaulle, with orders to unify the various resistance movements under the umbrella of the Conseil national de la Résistance (CNR). The gathering of 27 May was the first meeting of the CNR and Moulin’s efforts produced major changes in the organization of resistance to the Nazis. Within the month, Jean Moulin was arrested in Lyon where he was brutally tortured by Gestapo head, Klaus Barbie (‘The Butcher of Lyon’). Moulin was killed—some say beaten to death—en route to Germany. His tomb can be seen at the Pantheon, in Paris, among other tombs of France’s honoured dead. This entry was posted in World War II and tagged French Resistance, Jean Moulin, Klaus Barbie. Bookmark the permalink.